You've created an awesome video for your customers -- now it's time to share it! With Wistia it’s super easy to share your amazing content with your audience. Here are all of the ways you can share that masterpiece. Now that you’ve crafted that perfect video — and customized it to your liking — it’s time to share it with the world (or maybe just a few close friends and coworkers). Whatever you want to do with your video, Wistia’s got you covered. We’ve got lots of ways to share your awesome content. Let’s do this. It’s important to first note — Wistia accounts aren’t indexed by search engines, so your account (and the videos within it) will never come up in a Google search. Videos uploaded to Wistia remain private within your account; they are only available to the extent that you embed and share them. This means that sharing out a direct link to your Wistia account is one of the easiest and most direct ways to share your content with others, without sharing it with the whole of the internet. Check out our section all about sharing out a direct link (including some nifty examples). If you’re looking for a bit more security, we have the option to invite Viewers and/or Collaborators to your projects. Get the highlights of Private Sharing below, or check out the full guide over on our Private Sharing page. You also have the option to share your videos in email with your favorite email marketing providers, and even track their success! And last (but certainly not least) you can embed your videos, which is super easy thanks to Wistia’s flexible embed codes. Let’s get started with sharing a direct link. One of the fastest ways to share your video is with a direct link. Grab the Wistia URL from your browser (something like https://support.wistia.com/medias/h1z3uqsjal), and send it anywhere you’d like. You can further customize the landing page by turning comments on or off, and uploading your logo to your account to make the space your own. If you’re looking for even more customizations, we recommend embedding the video out in the wild. This way you’ll have total control over the viewing environment, and still get all of those sweet stats. This is a great way to get some quick stats, proof your videos before an official launch, or avoid any sort of code entirely. 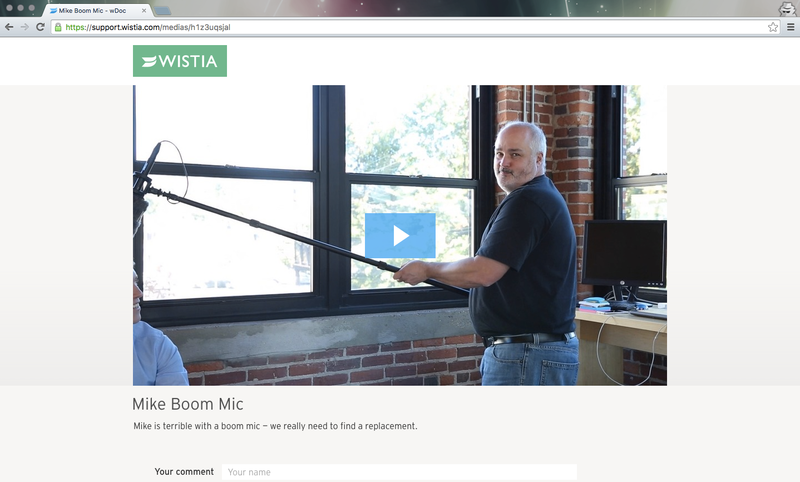 Any changes you make to the video will appear immediately on the Wistia media page. No new links necessary. Speaking of stats, to avoid muddying your public video stats, we house your in-app views in Private User Sessions. If you’d like to choose how your viewers are accessing your account and your videos, you can use Private Sharing to require a login to see your videos. Private Sharing in Wistia allows you to invite Viewers and Collaborators to specific projects in your account. 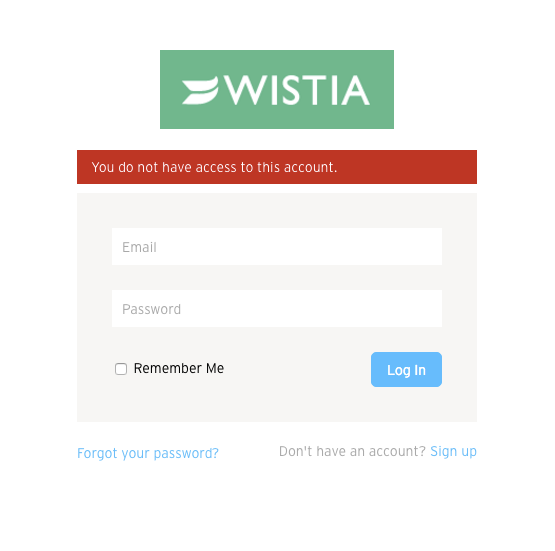 Inviting a viewer (via an email address) to a Wistia project gives the viewer access to your content, but your videos remain gated behind a Wistia login. If your viewer chooses to share any direct links to videos they have access to, your content will remain secure. Check out this example of a locked project we created. You might notice that even if you’re logged into Wistia, if you’re not invited to the account, you still won’t have access. Private Sharing is great for keeping your videos secure, selling content, and having more direct access to how viewers are interacting with your account. That data will live in Private User Sessions. If you’d like to gives viewers a bit more access to your video (customizing, stats, sharing further), you’ll want to invite them as Collaborators to the project. Check out the full details on our Private Sharing page. You can access Private Sharing on a project by selecting the padlock icon next to your project title, or by choosing Privacy & Sharing from the ▸ Project Actions menu. The most common way to share your videos is to embed them out in the wild. There are two types of embed codes at Wistia: inline embeds, and popover embeds. Inline embeds are pretty much exactly what they sound like — they’ll play right on your webpage, “inline” with your other website content. Popover embeds will play in a lightbox over your webpage when a viewer clicks a thumbnail or text link. We’ve designed embedding videos to be super simple. We want you to get your video content out there, and worrying about messy codes isn’t fun for anybody. In most cases, adding your video to your website is as easy as grabbing an embed code from the Embed & Share modal (under Video Actions) and popping it into your site. Check out our page all about embedding for a more in-depth walk-through. If you’d prefer that your embedded videos remain completely unindexed by search engines, we recommend using a no_index tag in the head of your page, or blocking site crawlers in your robot.txt file. You can also choose to uncheck the SEO Metadata option on the Embed and Share modal, which will tell Wistia not to inject the video’s metadata into the <head> of your webpage. Learn more on our video SEO page. For even more added security you can also Lock your Wistia projects as well. Wistia account URLs aren’t part of your embed code, but if you’ve shared around the initial link to your video, you can lock people out of your projects once the video’s live in the wild. Just select Privacy & Sharing from under the ▸ Project Actions menu. By using the button in the Privacy & Sharing modal you’ll be able to Lock the project. Sharing out your content with a direct link is easy and quick, but doesn’t often provide the detailed analytics of an email provider. That’s where Wistia’s Link in Email Campaign feature shines. We provide email merge tags for a ton of your favorite email marketing systems. These merge tags can track your viewers' Wistia sessions with an associated email address. So you can keep up with your leads' activity, and track the success of your emailed videos. Learn more about Wistia and Email Marketing on our help page. Just like a direct link, sharing videos socially is a great way to get some easy views, and get your brand out there. For many social sharing sites you’ll just need to drop your Wistia URL (something like https://support.wistia.com/medias/h1z3uqsjal) into the post you want to share. Most sites will pull in all the necessary information about your video, and you won’t need to do a thing. Check out the Social Sharing page for more help. You can further share your videos by giving your viewers the ability to download your videos. You can do this in two ways. You can allow all visitors to download from your Wistia media page (like we did for this video here). Select Privacy & Sharing from the ▸ Project Actions menu, or click the padlock next to the project’s title. Select the Everyone with this link checkbox to give the ability to Download the file. Alternatively, you can allow your viewers to download the video with the Share buttons. From within the Customize panel, navigate to the ▸ Share menu. Add the Download button, and you’re good to go! Want your video to start at a specific time? We’re here to help! To share your video at a specific time navigate to the Embed and Share modal under the ▸ Video Actions menu. In the Embed & Share window, select the Social Sharing option at the top. Under the URL you’ll see an option to Link to a specific time. Clicking the box will automatically link to wherever you’ve paused the video. You can also manually edit the time stamp. You can do this to any Wistia link by adding the wtime= string. Can I make a link expire? It’s not possible to make your Wistia links expire. If you’re looking for total control, we recommend embedding your videos behind a paywall. This will allow you to remove the video at a certain date, removing the access for viewers. Alternatively, you can use Private Sharing to invite the user to your project, and then delete their access when you need to. Can I password protect my videos without requiring a login? Yes, you can! We have an in-app require password feature, which allows you to add a password at the beginning of your videos. No login needed! Give the feature a try over in the Customize panel. Check out the Password page for details and instructions. If the Password feature isn’t up your alley, we recommend embedding your video behind a login with a third-party website provider.